By deploying a state-of-the-art mobile unit, NHS Trusts are able to maintain quality of care while treating more patients, and benefit from the increased income that the additional procedures bring. Not only is the cost of a mobile unit considerably lower than those associated with procuring services from a private hospital, it also guarantees ownership of the patient pathway and, as a result, affords complete control of additional costs. Similarly, when faced with a sudden peak in demand, healthcare organisations can ensure that additional capacity can be achieved quickly and affordably, without the risk of growing waiting times or cancelling lists. 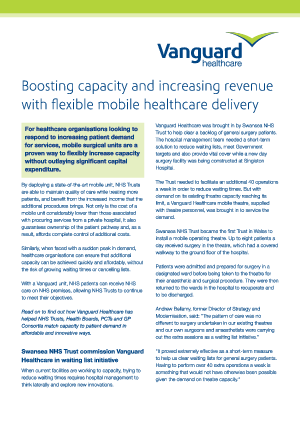 This case study shows how Vanguard Healthcare has helped NHS Trusts, Health Boards, PCTs and GP Consortia match capacity to patient demand in affordable and innovative ways.